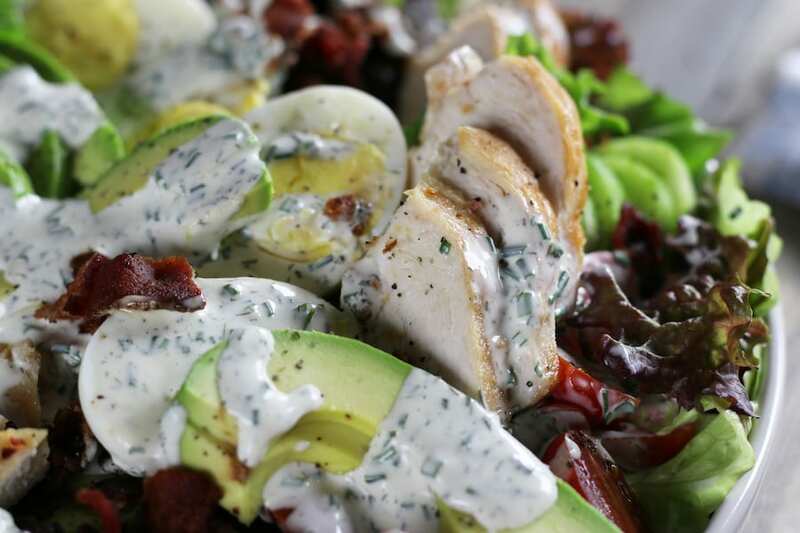 Creamy Avocado Chicken Salad is a super delicious low-carb feast. 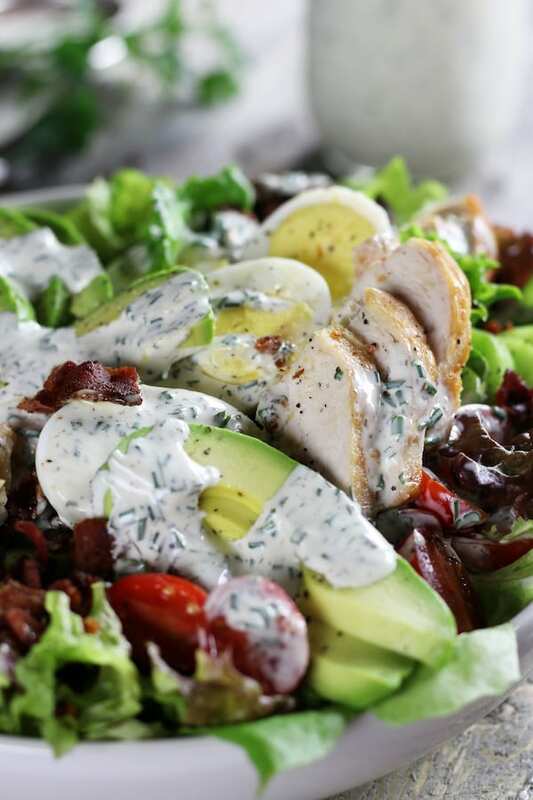 Completely mouthwatering with a homemade ranch dressing, bacon, hard boiled eggs and loads of healthy veggies. I have always been a huge salad lover. Back when I was a teenager, some of my favorite meals were buffet style salad bars where my parents would cut up all kinds of veggies, make hard boiled eggs and have a big platter of albacore. 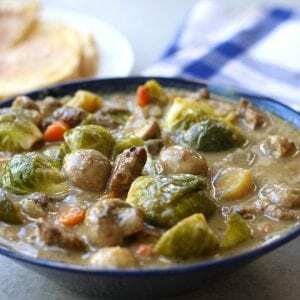 We could pick and choose our favorite ingredients and it was such a fun, satisfying and wholesome way to eat dinner. This love of eating salad for dinner has carried all the way through my adult years although we don’t do buffet style any longer. We now tend to make salads that are easy but have all kinds of different flavor profiles like Lazy Day Chinese Chicken Salad, Simple Strawberry Salmon Salad and Shrimp Avocado Salad. I also really love it when a salad, by itself, can pack a nutritional punch like my Blueberry Basil Chopped Veggie Salad, Kale and Brussel Sprouts Salad and Rocket Your Mind Salad. However, I still fall over heals in love with the classics like this Avocado Chicken Salad or my Chicken Caesar Salad with Homemade Croutons. Hopefully my obsession helps inspire a few salads for your dinner table too. Put the eggs onto boil and preheat oven to 375℉. Place 1 tbsp oil in the bottom of an oven safe frying pan and place over med/high heat. Sprinkle 2 boneless skinless chicken breast with salt and pepper and sear both sides for 3 to 4 mins. Once seared, bake until internal temperature reaches 165℉. Remove from oven and let cool. Searing before baking will give the chicken a beautiful golden color and speed up the baking process. Two boneless skinless breasts could take as little as 10 minutes to finish baking. While chicken is baking, finish the hard boiled eggs and fry bacon. Once everything is cooked and is cooling, wash and prepare veggies. ***Pro Tip: While assembling dinner salads also assemble salad for lunch the next day. This makes packing lunch so much easier. One of the biggest challenges for avocado lovers is picking avocados that are perfectly ripe. They seem to be rock hard and them BAM, mushy and over-ripe practically over night. Here are a few tips for helping to pick a perfectly ripe avocado. 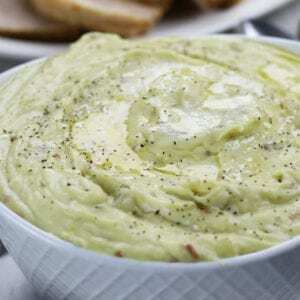 A ripe avocado will have a slight amount of give to it. The best way I can describe this is to have you flex your arm as hard as you can. You know, like how muscle men do or when your husband is trying to impress you. Feel the firmest part of your flexed bicep, that is a very similar feeling of firmness to what a perfectly ripe avocado feels like. Not exact, but very similar. Another way to tell is that the little nub of the stem is easy to remove with only a slight amount of give to it. Behind the stem should be a bright beautiful green color when it is ripe. If it is a dark mossy color the avocado is over ripe. Hopefully the first two tips will guide you towards picking a ripe avocado. If you get to the point of cutting it in half and it is difficult to cut through the flesh, stop because it is not ripe yet. Ripe avocados are fairly easy to cut in half. Don’t worry if you cut into an avocado that isn’t ripe, it is not ruined. Just let it finishing ripening and cut around and discard that portion when it is ready. ***Pro Tip: To ripen avocados quickly place them in a brown paper bag with one bunch of bananas. Seal the bag by rolling the top and place on your countertop for as little as 1 day to 5 days. Bananas release a gas that help avocados to ripen quickly. Just make sure to check them daily. How do I make crispy bacon crumbles? To cook bacon the classic way, lay 4-5 pieces of bacon in a large, cold frying pan making sure the slices do not overlap. Place pan over med/high heat. Using long handled tongs turn strips when they reach the halfway point of cooking. The total time will depend on the thickness of the bacon slices. Thinner cuts take about 5 minutes total cooking time and thick cuts usually takes about 8- 10 minutes. Bacon slices often will need to be turned a few times until desired crispness is achieved. Once cooked, place bacon strips onto a plate lined with paper towels to absorb excess grease and then let cool. Once cooled, group bacon slices together on a cutting board. Using a sharp chef’s knife, carefully chop into desired crumbles size. What’s the easiest way to hard boil eggs? Place desired amount of eggs single layered into a sauce pan small enough that the eggs don’t roll around. Cover eggs with cold water by 1 inch above the tops of the eggs. Place on med/high heat and bring to a rolling boil. Once boiling turn off heat and cover with a lid. Let sit in hot water for 10 minutes. After 10 minutes drain off some of hot water and add cold tap water. Repeat the process a few times and then refrigerate hard boiled eggs until needed. This creates perfectly hard boiled eggs every time and the best part, there is only 1 pan to clean. What types of lettuce can I use besides romaine? 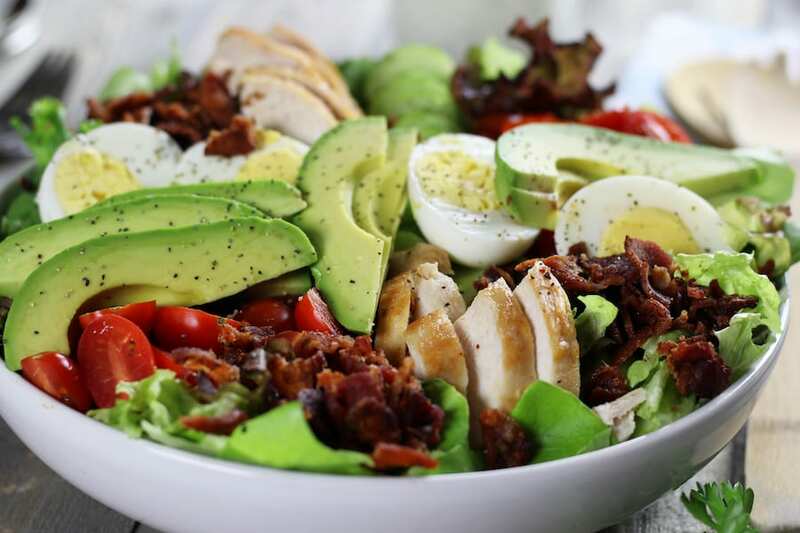 Is this Avocado Chicken Salad Paleo? Yes, but there are two things to consider. 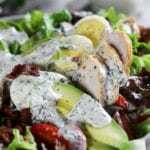 This Avocado Chicken Salad is dressed with my Creamy Low Carb Ranch Dressing that does contain a small amount of sour cream. Some in the Paleo community are ok with occasionally having a small amount of dairy and others are not. The dressing also has a small amount of Worcestershire sauce. To keep it in the Paleo guidelines here is a Paleo Worcestershire. If I pack this for lunch how do I prevent the avocado from turning brown? In my many years of packing salads with avocado I usually never had an issue with avocados turning brown because I would use this. A second sure fire way of making sure your avocados don’t turn brown is to sprinkle a little bit of lemon juice over the top of the avocado slices. So fresh and creamy! This Avocado Chicken Salad is one of my favorites to eat for lunch or dinner at anytime during the year. It's low carb, full of nutrition and healthy fats. Place eggs in a small to medium sized sauce pan. Cover with cold water 1 inch above the tops of the eggs. Bring to a rolling boil over med/high heat. Once boiling turn off heat and cover with a lid. Let sit for 10 mins and then drain. Fill hot pan with cold water and drain again. Repeat a few times and then let sit in cold water until eggs are cool enough to handle. Crack eggs by gently tapping on counter tops. Carefully peel off hard shell and rinse egg of any eggshell pieces. Cut into 1/4's for salad. Place an oven safe frying pan over med/high heat and add oil. Salt and pepper each side of chicken. Once pan is heated sear each side for 3-4 minutes per side. Place frying pan in oven and bake until chicken breasts reach and internal temperature of 165℉. Cooking times will vary. Smaller breast may be done within 10 mins, larger breasts my take up to 20 mins. Remove from oven and let cool enough that you do not burn yourself. Slice into pieces for the salad. Place 4-5 slices of bacon into a large, cold frying pan and place over med/high heat. Turn bacon slices once they reach the halfway point of cooking. A few additional turns may be necessary. Cook until bacon reaches a dark golden brown color and has shrunk in size by half. Thiner bacon will take about 5 mins, thicker bacon will take 8-10 mins. Place cooked bacon on a paper towel covered plate. Once cooled to the touch place bacon strips on cutting board and cut into bite sized pieces using a chef's knife. Using either a sharp pairing knife or chef's knife, carefully cut avocado in half. Remove seed and peel avocado skin off. Cut avocado half into slices. Throughly wash lettuce and shake off any excess water. Tear or cut into bite sized pieces. Wash tomatoes. Cutting tomatoes in half is optional. Peel and cut cucumbers into coin slices. 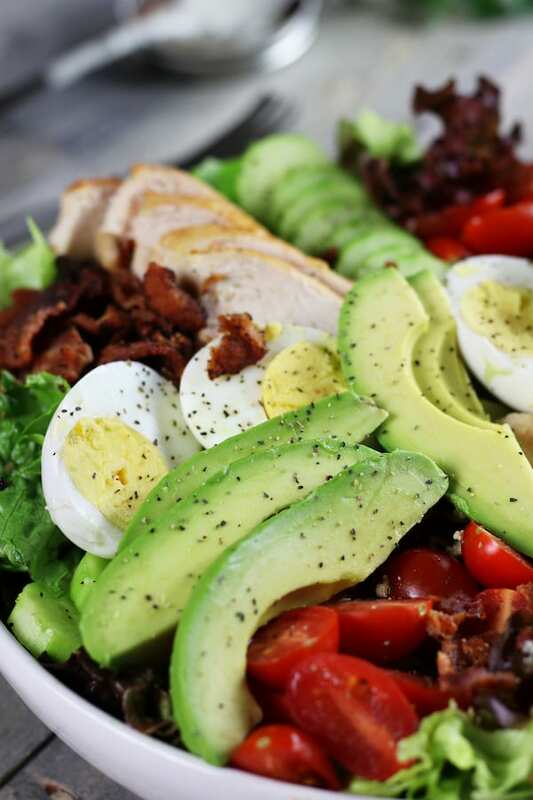 Assemble salad with lettuce, cucumbers, tomatoes, bacon, chicken, avocados, eggs and dressing.